Wright (Cut Stones and Crossroads: A Journey in the Two Worlds of Peru; On Fiji Islands) is a journalist, travel-writer, and--significantly--a Maya scholar. Here, his knowledge of the dauntingly complex Mayan culture (which built great ceremonial cities including ChichÇn Itz† during the Classic Age, A.D. 300-900) results in a corresponding complex--and valuable--book. 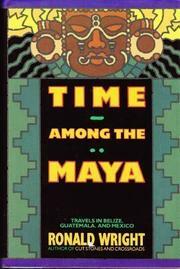 The "Time" of the title refers both to the two and a half months Wright spent in Mesoamerica in 1985, and to the fact that much Mayan religion, philosophy, and political activity is informed by a cyclical vision of time and extraordinarily sophisticated calendrical calculations--all of which are covered here, making for some rough spots for the unmathematically inclined in spite of the author's clarity. Wright also provides a broad and contrasting look at the history, ethnography, and language of different Mayan groups; and his discussion of archaeological sites will be useful to serious visitors (he's especially good on Tikal, Quirigu†, Palenque, and Bonampak). His encounters with the modern Maya reveal survival and persistence of tradition--in spite of the twin threats of assimilation in Belize and Mexico, and repression--including physical extermination--in Guatemala. Not a fast read, but a mix of scholarship and travel-adventure that celebrates Mayan culture and may even play some role in preserving it. MINT TEA TO MAORI TATTOO!